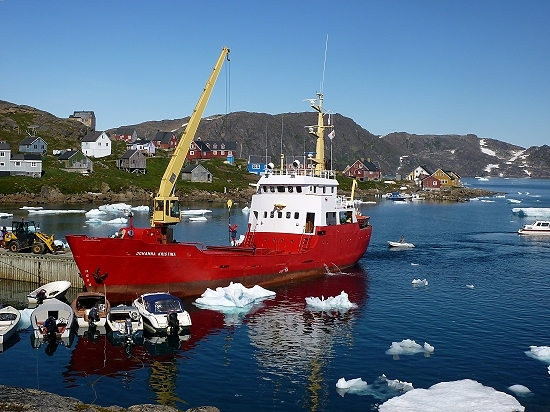 There is a vessel run by the Royal Arctic Line that services the 6 settlements in the region, Kulusuk, Isertoq, Tasiilaq, Kuummiut, Tiniteqilaq and Sermiligaq. It visits one settlement per day on a rotating basis and by very good fortune, it happens to leave the town of Tasiilaq on the 30th August, which is when I intended to start my expedition. I will book myself and my kayak onto the Johanna Kristina now and that will put me at a point 50 kms north which will give me a good headstart on the trip. The boat doesn't arrive in Kuummiut until 1 pm so I will probably camp in the area or stay in Kuummiut that night, getting an early start the next morning.